So on my bourbon travels I have been more and more experimenting with the concept of cooking with Bourbon...and I must say Bourbon goes so well food on the side or in the pot. Ribs, ribs ribs...Bourbon goes sooooooooo well with pork ribs (but that's another story). So I thought I would share a little recipe I have been developing over the last 5 months. As a side note I have cooked all my life and so it is hard for me to put something on paper when it is all in my head. I have also tried to break down the process enough so any D.T.W.C. member can make this to impress the ladies. 4 medium potatoes washed cubed large or divided into 4 quarters each (with skin) or brushed (peeled). When cubing and peeling potatoes add to ready filled bowl of water to stop browning of flesh. 4 heaped tablespoons of plum or raspberry jam (this is real jam and not that weird jelly stuff). Use plum for deep flavour and raspberry for rich sweet and if you know your bourbon then you will know which one to match. Step 1: take dram of bourbon and have a sip for courage. Step 2: pre-chop, dice, cube and prepare all ingredients as above. Step 3: roll diced beef with flour (a good trick is to take a plastic freezer bag or vegetable bag left over from purchase of ingredients and put beef and flour inside, twist to seal and shake until beef is coated with flour). Step 4: heat pot on stove with some olive oil and add beef and flour from bag. Cook on low heat until beef is brown (don't worry of flour sticks to bottom, don't scrape it off, but make sure it does not burn). When beef is browned (that means you can still see some red bits on surface slightly) remove from pot and place on plate to rest. Salt and pepper beef now. Step 5: in the same pot beef came from fry onions in olive oil until transparent (keep heat low to avoid burning as you don't want the onions brown or caramelised), add fresh crushed garlic and chillies and fry on low for an extra 20sec or so (any longer and garlic and chillies will lose all flavour and essential oils). Step 6: when onions and garlic are ready, add 200ml bourbon and quickly boil on high heat (this is to burn off the alcohol and it should only take 30sec or so) then add all vegetables (mixed beans, corn kernels, potato, carrot, suede or parsnip, parsley, rosemary, celery) and allow to heat on a medium burn for 2min. Step 7: add beef back to pot and mix through. Step 8: add tinned tomatoes, beef stock, and jam. Taste and season to fit (how do you know to season? If it is too sweet add some salt and pepper but be gentle as you could easily kill it like a over zealous alchemist). By this time the ingredients should have a deep red colour like iron. You may have to add a cup of water at this stage if ingredients look dry (only fill until ingredients are just covered as lot's of fluid will come out of vegetables). Step 9a: if using pressure cooker whack on lid and allow to cook for 45min once pressure builds. Step 9b: if using pot bring all ingredients to boil then reduce to simmer for 30min (that means the lowest temp possible while seeing slight movement in pot ingredients DO NOT BOIL). Once simmer is complete put pot with lid in oven and allow to slow cook for 2hrs at 180 degrees (check and stir regularly, do not allow to stick to bottom nor boil over) and adjust temp 10 degrees up or down depending on how shady your oven is. Step 10: once cooking is complete rest pot on bench top for 15min to 30min with lid on. This is essential or you will burn the skin off the top of your mouth and no one like that flappy pealy skin thing that goes on for days after. While it cools at your loaf of crusty bread to cooling oven to heat gently. 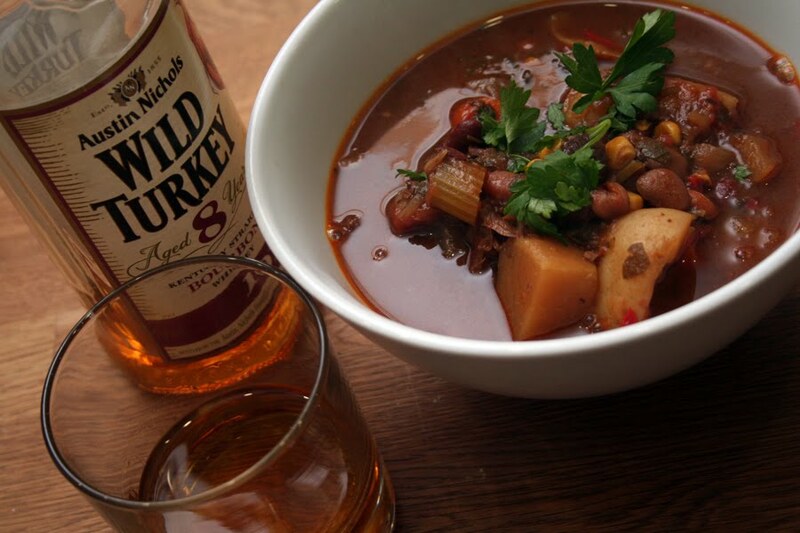 Step 11: serve in bowls with crusty hot bread, cracked pepper, and on side and dram of bourbon. Gotta love the table whisky (thanks Alchemist). To taste you should encounter a rich deep sweetness coming form the bourbon and fresh corn with highlights of sugar form the jam. the colour should be very deep red like the colour of rusted iron. I highly recommend at least one attempt at this before whipping it out on the ladies as you need the meat to be tender and succulent. Also I can recommend allowing to cool overnight and heating again the next day and serve to really intensify the flavours. So after all that I guess you are wondering what whisky I use for this dish. Well I think the picture tells it all but for those whom need to know it is Wild Turkey 101 Aged 8 years. I really like the intensity of the 101 over the standard release Wild Turkey. The flavour of corn and maple is rich and vibrant but it is cut by the a slight dryness in the alcohol. Certainly my favourite table whiskey with bbq, ribs or stews. If I was to give a dram on the Wild Turkey 101 then it would be a 6 out of 7 as it has lots of guts and robust flavour. As a follow up I have a great recipe for bourbon infused flour dumplings/damper that goes perfectly with this dish but I thought to leave that for another day. get this one right first lads and then we can move on.